One thing I do miss now and then, especially this time of year (since going Paleo) are noodles. But fortunately, spaghetti squash is in season. What perfect timing! And honestly, this soaks up flavor so much better than any “noodle” out there. And…it’s easy to make. Just slice, clean, roast and go! While I love cooking this time of year, it is absolutely my most hectic time of year with work and all, so I have to try to make things that aren’t time consuming or at least take short cuts. This one is easy because there isn’t any chopping, and I really didn’t even had to do much cooking since I used an organic rotisserie chicken from Whole Foods. Yay! Two big time savers for me, although making an actual whole chicken really doesn’t take 5 minutes to prepare. So this great recipe is a rendition from PaleOMG. If you don’t know her site, you need to check it out. Her meals are amazing! Anyway, this is what you need for this paleo Chicken Pesto “Noodle” recipe. IMPORTANT NOTE: If you use a whole chicken like I did, then you’ll need to double all of the ingredients below. Or, just use about 1 lb of the whole chicken. Start by slicing your spaghetti squash in half, scoop out the seeds, and then put both sides, face down on a cookie sheet. Cook on 400 for 20-25 minutes or until soft. I do add about 2 tbsp of water to the pan. I’m not sure if you need it, but it seems to work well for me. Now while that is cooking, turn your a pan on high, add butter and your garlic cloves and let it start to get brown for just a minute or two. As soon as it does, add in the canned artichoke hearts. Let cook until it all a nice brown, and then transfer to your blender. 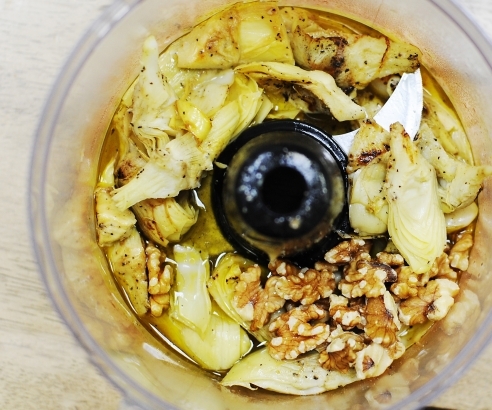 Then add your olive oil, walnuts, lemon juice, chicken broth and blend until smooth. Oh, if you could only smell this once it was blended! 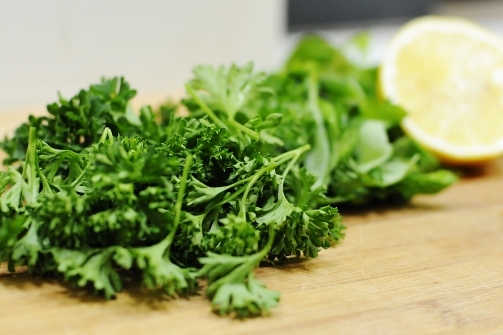 Then pull your parsley and basil part (no need to chop!) and add that to the blender. Now blend until smooth or you find a consistency you like. Next, tear apart your chicken, or cut (if you don’t have a rotisserie chicken) it into bite sized pieces and put in a large mixing bowl. If you are cooking your chicken, cut your raw chicken into bite sized pieces, cook it in some coconut oil with some salt and pepper until thoroughly cooked, and put it in your large bowl. Next, get out your spaghetti squash, spoon or fork out the good stuff, and put that in the bowl. Lastly, add your pesto, salt and pepper to taste, and enjoy!!! 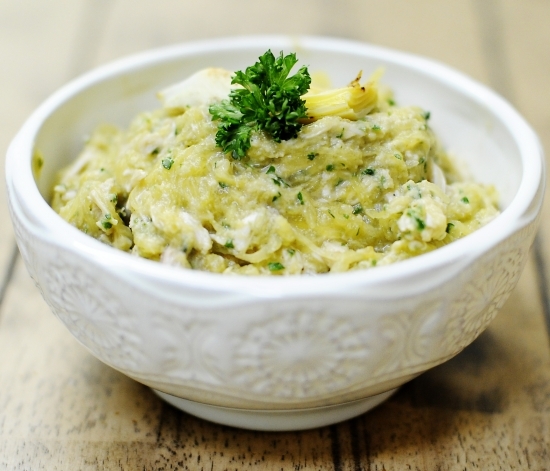 My kids loved this but they also love basil and artichokes so I thought they might like it. I loved it. And my husband just liked it. Boo Scott. He actually said it was good, but tasted more like a “dip”. I bet the pesto would actually make for a great dip! Oh well, can’t please them all, all the time…right? 3 out of 4 ain’t bad though! Oh and lastly, I do apologize if there are any errors. There is just not enough time in the day lately but I did want to share this with y’all. If there are any mistakes, please let me know. I’m not good with details, and especially this time of year! I did notice you said cut the butternut squash in half….but we all knew what you meant! PS. The Thai Turkey burger has become one of our favorite regulars around here.